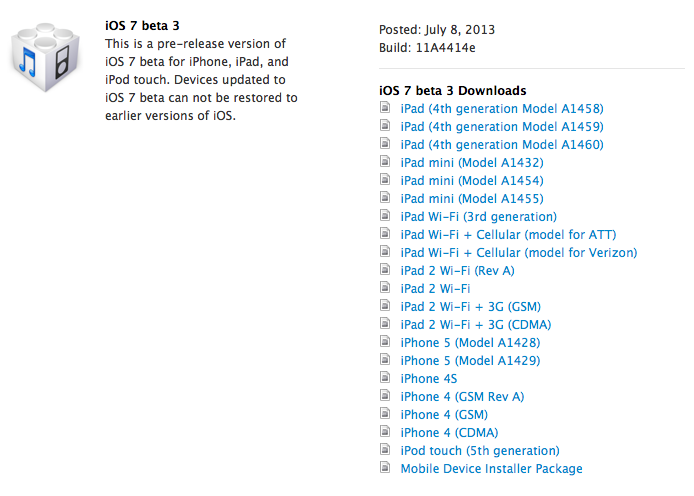 Yesterday, I posted post on download updated version of iOS 7 beta 3 but now you can download your iOS 7 beta 3 update version on your iPhone, iPad and iPod Touch device through direct links. Apple has released the 3 beta for developer as scheduled, now the registered developers can directly download iOS 7 beta 3 (bulit 11a4414e) for iPhone, iPad and iPod touch. I know that plenty mobile users are using iOS 7 beta 3 but not take tension now there is a solution about how to update your iOS 7 beta 2 to iOS 7 beta 3, you just need to update 3 via OTA (Just launch the Settings app and navigate to General -> Software Update to update). Regardless, if you have a sign up UDID, you can update your to beta 3 whenever from 6.1.X as long as you want, you just require to download the iOS 7 beta 3 ipsw file from the links below, then click on “update” icon in iTunes to install the ipsw file. Push he Shift (Windows) or Alt/Option (Mac) key and hit the Update icon on iTunes. Really, if you are genius developer, you can update beta 3 with Xcode 5 Developer Preview 3, which Apple just released. If Windows customers want to covert a dmg file to ipsw format then they will require finding 7-Zip program to convert that. Stpe#2 - Choose file and click open. Step#3 - Search out the DMG file of iOS 7 Beta 2 and click to open it. You will look all kind of files in this archive. Step#5- Just figure out the 7-Zip program to where you would love your IPSW file to be saved.